An edible fern that is well known to all Japanese people is Osmunda japonica, called zenmai in the Japanese language. This widespread fern is in fact not only delicious, but a lovely plant in and of itself. 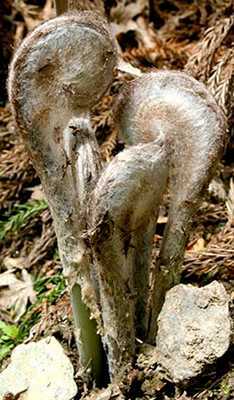 Osmunda japonica is a large deciduous fern with a thick rhizome that occasionally can form a small trunk (caudex). There are two frond types that show extreme dimorphism: the spore bearing sporophylls and sterile trophophylls. The sporophylls emerge concurrently with the trophophylls and grow vertically to a height of 30-70cm tall. Approximately half way up these specialized fronds opposite pairs of branches form (analogous to the pinnae) and off these are paired spore bearing structures – highly modified pinnules. These are literally covered in cinnamon brown, naked spores, hence giving many in the genus the name cinnamon fern. The sterile fronds of Osmunda japonica look similar to the North American species Osmunda regalis, but are a bit more stout. 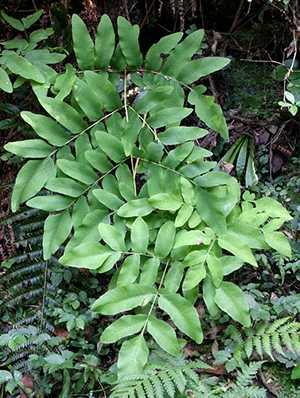 The trophophyll by comparison looks much like a typical fern frond and is twice pinnate growing anywhere from 60-100cm long and 40-60cm wide. The pinnae grow in opposite pairs off the rachis and the oblong pinnules occur alternately and usually are unlobed. The stipe accounts for a third of the length of the frond. The impressive crosiers emerge covered in whitish-brown hairs, but these soon fall off leaving the stipe and rachis completely smooth. Plants usually occur as a single growth with no offsets, but often forming extensive colonies. This species is widespread on the mainland islands of Japan, also Russia (Sakhalin), Korea, Taiwan, China, Indochina, and the Himalayan Mountains. It is common in moist to wet forests, field-like slopes that are annually cut, seepage slopes, road cuts, swales, and ditches. On Kyushu it can be found at all elevations, 0-1000+ meters. O. japonica is one of the better known ferns in Japan due to the emerging crosiers that are collected each spring as a seasonal food. Traditional foods in Japan are deeply linked to the seasons, no matter what type; roots, herbs, shoots, and even fish. The fertile fronds of Osmunda japonica are similar to other members of the genus and are why one common name for them is “flowering ferns”. In spring it is common to see cars parked along roadsides, and people out foraging for their favorite herbs. Zenmai is often eaten with takenoko (bamboo shoots) taken from the huge bamboo species called moso, Phyllostachys pubescens. Each spring my neighbors come to my door with both takenoko and zenmai as a seasonal gift. These are prepared by boiling them in a pot with water and some seasoning such as shouyu (soy sauce), su (vinegar), and sato (sugar) until soft. As my girlfriend says, “it is a taste of spring!” Another commonly eaten fern in spring is warabi, Pteridium aquilinum, a species that is a known carcinogen. I’ve heard that zenmai is not as dangerous, but being on the safe side, I only consume either in any quantity in the spring, and just a couple of times a year. The fern itself is very common, being found just about anywhere there is adequate moisture. It is very reminiscent of its relative O. regalis, but is more stout in stature. The conspicuous spore bearing fronds emerge alongside the sterile fronds in mid spring and are quite lovely in and of themselves, and thus earning this type of fern the nickname “flowering ferns”. 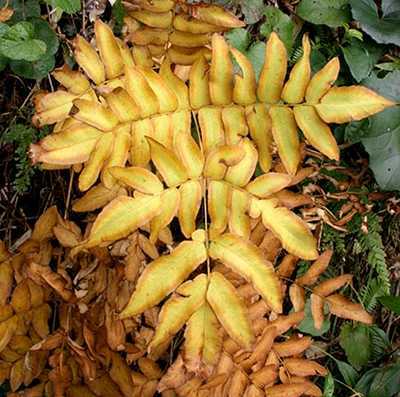 In fall their foliage turns a bright yellow and is attractive for a short time. It can occur as a single clump or form extensive colonies, but always in the company of other fern species. I’ve grown this one for many seasons now. It appears to be pretty easy in a lightly shaded to partially sunny location with evenly moist soil. Any good loam will do for these just fine. They are not wetland dependent like O. regalis. Given their wide natural distribution, I’d say they can be grown over a broad range of climates (USDA cold hardiness zones 3-10). The croziers of Osmunda japonica are a common food in Japan in the spring and are called zenmai. Zenmai is the name given to both the fern and the fiddleheads which are a spring food throughout Japan. The Japanese name, zenmai, means a “spring, coil, or mainspring” and probably is a reference to the shape of the crosier which looks like a coiled spring. This word is used in Japan to mean the crosier as a food eaten in spring or the fern as a species. I think this cinnamon fern is a lovely addition to any suitable garden. While it is similar to the more commonly known O. regalis, it is no less lovely, and possibly easier to grow as well. The hardest part will be finding plants for sale on the international market. In the fall Osmunda japonica puts on a brilliant, but brief display. Fascinating that Osmunda regalis is considered one of the best species at removing formaldehyde from the air. If you live in the USA would recommend contacting Plant Delights in NC since they handle so many Japanese plants. Another possibility is to try its close relative O. regalis. The only thing is that these typically are outdoor ferns, so I don’t know how reliable they will be as houseplants. Please help me with a point of confusion. One site says warabi is Diplazium esculentum with synonyms being Anisogonium esculentum and Athyrium esculentum. Another site says warabi is Pteridium aquilinum. Do the Japanese call any fern they eat warabi?? If so what is the most toxin free in your opinion? I hear the Diplazium is very safe. Thank you for any light on the subject. Indeed, the word warabi does show up a lot for edible species of fern. While Pteridium aquilinum is the true warabi, any species that is commonly consumed is often called that, hence the confusion. As far as I know, Diplazium esculentum is the correct name while the other two are synonyms. Apparently this species is so widespread over Asia that is one of the most commonly consumed ferns in the world. As to safety, I cannot speak with authority, but I’d go with the commonly eaten ones like P. aquilium and D. esculentum. I’ve eaten Osmunda japonica and P. aquilium with no ill effect, though in both cases the fern was processed correctly. In Japan the shoots are boiled several times in charred rice bran or the like to remove the nasty glucoside (ptaquiloside), but studies have shown this may not be truly effective. For that reason esophageal and gastric cancer rates are significantly higher in people who commonly consume this product. If you engage in light consumption, you should be OK, but I would recommend against frequent use. Here in Japan it is eaten primarily as a spring food since that is when most ferns grow the bulk of their vigorous new fiddleheads. Hope that helps. Hey, I’ve got a quick question, are there any myths surrounding zenmai? Like increased healing or rejuvenation? Interesting question. All I can say is that since Japan is a island chain, at times in the past there have been periods of famine, and during these times people were driven to eat what they call “emergency foods” or “famine foods”. Famously the poisonous cycad species, Cycas revoluta, was such a famine food and many people suffered horribly. Ferns are another group that people turned to, and in more recent times, continue to eat on a fairly regular basis. Popular ferns to consume even to this day include the bracken fern, Pteridium aquilinum, and the Japanese royal fern, Osmunda japonica. Both are implicated in higher stomach cancer rates in Japan, and bracken is well known for its toxicity in livestock that over consume it. Since the fiddleheads or croziers are what are consumed, this is a spring food only in Japan, thus limiting the toxic effect (if there is any) to this season. 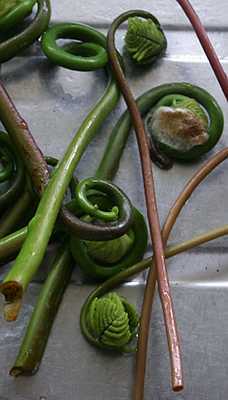 It is believed that eating fiddleheads in the spring actually remove toxins from the gut that have “accumulated” over the winter cold season. This kind of belief is common to many folk medicine systems throughout the world – a sort of “spring tonic”. 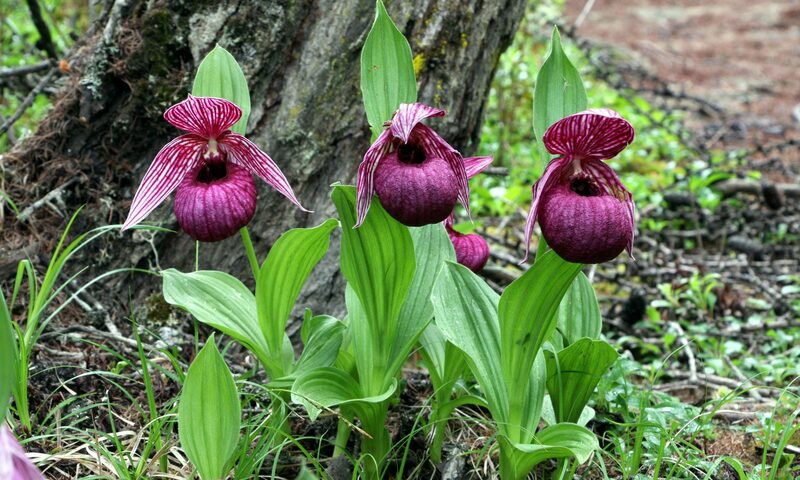 Other than that, I cannot think of any myths surrounding this plant in Japan.